1/4 teaspoon freshly ground black pepper, or to taste. Note: One (16-ounce) can of pigeon peas or green peas, drained, may be substituted for the dried peas. Skip first two steps. Drain the peas and return them to the medium saucepan with enough fresh water to cover by 1 inch. Bring to a boil over high heat, reduce the heat to low, and simmer until the peas are tender, about 1 hour. Drain again. Meanwhile, in a 5-quart Dutch oven or soup kettle, bring the corned beef, ham hock, and water to a boil over high heat. Reduce the heat to low, and simmer until the meat is tender, about 1.5 hours. Drain the meat, reserving both the meat and the cooking liquid. Remove the meat from the ham hock and chop it coarsely; discard the bones. In a 5-quart Dutch oven or soup kettle, heat the oil over medium heat. Add the onion, scallions, garlic, and chili pepper. Cook, stirring often, until the onion has softened, about 4 minutes. Stir in the tomatoes, tomato paste, chives, and thyme, breaking up the tomatoes with a spoon. Bring to a boil, reduce the heat to low, and simmer for 10 minutes. 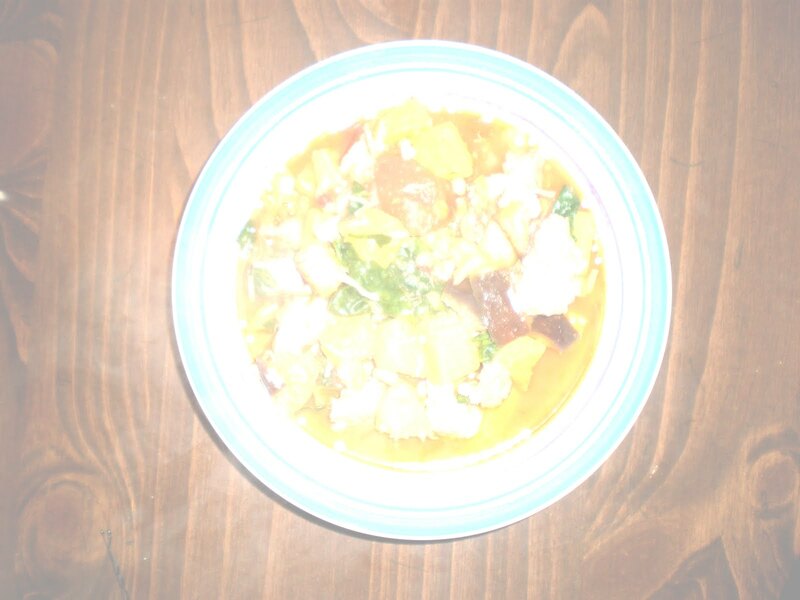 Stir in the eggplant, calabaza, and white yam and cook for 5 minutes, stirring often. Stir in the reserved meat cooking liquid and the meat. Bring to a boil, reduce the heat to low, and simmer, stirring often, until the vegetables are tender, about 20 minutes. Stir in the cooked pigeon peas and the spinach, and cook until the spinach has wilted, about 5 minutes. Season with the pepper, to your taste depending on the hotness of the chili pepper.